I think it’s safe to say that March became the month of Henry IV here. After covering the usurpation of 1399 and its implications in the Wars of the Roses compared to Edward III’s 1376 entail, today we’re going to skip forward to 1413, the year Henry IV died. The moment was captured most famously by William Shakespeare when young Prince Hal picks up his father’s crown before he’s dead, but the real King’s illness in his last years, his increasing isolation and hibernation and his tumultuous relationships with his sons – particularly the future Henry V – has long led to speculation that Henry grew to regret his actions against Richard II. So, let’s consider what we know and at what we can guess. Shakespeare’s version of events weren’t pure fiction – it was formed from political propaganda and gossip that many believed and which had some elements of truth in them. 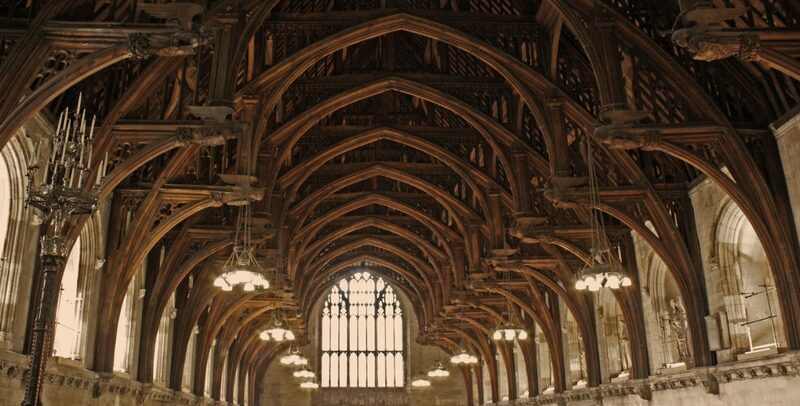 The traditional legend saw Henry IV on his deathbed in the Jerusalem Chamber within Westminster Abbey. He fell unconscious, was believed dead and a sheet was pulled up over his face. Prince Henry took the crown and left the room, at which point a sigh was heard from under the sheets and the attendants pulled it back to show a king still very much alive. The Prince was called back and asked to answer for his actions. “And how, my son, do you have any right to it, for as you well know, I never had any?” The King responded. Thus, we are told, he died. It’s not hard to see why this version of events would have so appealed to writers over the centuries. It’s dramatically perfect, and even after the reigns of these men had long passed, it’s almost all the more poetic with the benefit of hindsight following Henry V’s rule. However, the truth – or what we know of it – was a bit different. In reality, Henry IV spent the last years of his reign afflicted from a skin condition that we can’t fully diagnose. He wasn’t, as he has been called, a leper, but he was at times so ill that it was difficult for him to carry out the functions of his monarchical duties. For a period of nearly two years ending in the autumn of 1411, Henry IV all but retired and it was Prince Henry who served as the head of council. Strife between father and son wasn’t all fiction, either. Henry IV’s favorite son, by all accounts, was his second-born, Prince Thomas, Duke of Clarence. Indeed, he is the only one of Henry IV’s younger sons that was named a duke during their father’s life. John and Humphrey wouldn’t be elevated to the same status until 1414, when Henry V named them the dukes of Bedford and Gloucester, respectively. This dynamic naturally led to jealousy between Prince Henry and Thomas, a situation made all the more complicated when it was Prince Henry who effectively ran the government for a period of a few years. Layer in that the King was failing and Prince Henry was ambitious, and you have a situation in which some of the King’s ministers began sidling up to the heir in anticipation of the new reign. One matter on which King and heir were opposed was France. King Charles VI had long suffered from bouts of insanity that forced a regency, however he recovered frequently enough that the situation only became more chaotic as a result. By the time Henry IV came to the throne in 1399, power was primarily held by Charles’s younger brother, Louis, the Duke of Orleans, however there was a presence of male uncles and cousins that served as a check on his authority, not to mention Orleans became deeply unpopular with the people of Paris. The man who came to the forefront of the opposition was their cousin, Jean, Duke of Burgundy, and in the autumn of 1407, he ordered Orleans’ assassination. Instead of leading to his downfall, the House of Valois was all but forced to make their peace with him, however Charles’s own son was slowly coming of age and Orleans’ son, the new duke, had little interest in keeping peace with a glorified murderer. Instead, two factions grew increasingly solidified in their hatred for one another – and their belief that they had better right to hold the government of France until the dauphin reached his majority. As for where England came in, they had long-claimed Aquitaine as their own. Well, they claimed all of France at various points, but it was the duchy of Aquitaine that they had a better shot of getting, in theory. Thus, the English used the brewing civil war to their advantage, playing both sides off the other and promising military support so long as their payment came in the form of recovered lands. Which side to support, however, was from where the disagreement came. Henry IV was inclined to side with “the Armagnacs,” or the side led by the young Duke of Orleans. Prince Henry, on the other hand, was more sympathetic to the Duke of Burgundy. Thus it was that when Henry IV took back control of council English support for the Burgundians was dropped and new negotiations with the Armagnacs were ongoing through 1412. The King, however, was on his last legs. By the dawn of the year, he wasn’t able to easily travel or ride, and when matters awaited him in London, he instead tarried in Canterbury from the end of February well into April. Likely, he was waiting to die, for he had made his wish to be buried in Canterbury Cathedral well-known. Instead, he lived and made his way to Westminster where he quickly became embroiled in the warring of his eldest two sons. Prince Henry had fallen out with Thomas after their father took back control of Council and then replaced him with Thomas. His time at its head had given him a number of allies, not least of whom were a few members of the powerful Beaufort family, led by the King’s half-brothers. When the decision came to send forces to France, the army was led by Thomas, while Henry left London in disgust. The eldest son would eventually be reconciled with his father that summer, but the two princes remained at odds when Thomas left the country. In September, Prince Henry was back at court, however one day as he walked through Westminster, a spaniel sniffed out a man hiding behind a wall hanging in his chambers. The intruder, apparently, was there to assassinate the Prince, however when the tale was raised in Parliament in 1426 – after his death – the plot was argued to have been at the prompting of Henry Beaufort, Bishop of Winchester. This last part is highly unlikely, if for no other reason than the Bishop and the Prince were allied at this point. More likely is that the Bishop was accused of the crime by his political enemies, which were led by none other than the Prince’s other younger brother, Humphrey, Duke of Gloucester. In December 1412, Parliament was summoned for the new year, but Henry IV’s health continued to decline. He traveled between residences in January, but in February he returned to Westminster. He appeared once in public during the session, but otherwise stayed in his private apartments on his sickbed. There are a number of accounts of conversations from Henry IV’s final days, two of which ring somewhat true. The first is that the King summoned his eldest son to his bedside and shared his fear that he and Thomas would remain at odds, and that such might be his younger son’s downfall. The Prince reportedly responded that he would love and honor his brothers above all others, so long as they remained loyal to him. If they didn’t, he said, then he wouldn’t hesitate to carry out justice. This sounds exactly like the future Henry V, so if it’s only another tale from his cult of personality then it’s one that was very well done. The second conversation was with Henry IV’s confessor, who urged him to ask for forgiveness for three crimes: 1) the murder of Richard II, 2) the death of Archbishop Scrope (a tale for another time), and 3) the 1399 usurpation. Henry responded that he had already received absolution from the Pope for the first two, and that he could never ask for forgiveness for the third because doing so would weaken his line’s ability to hold the crown. Thus, until the end, Henry maintained that his path to the throne was cleared by the false claim that Richard II had willingly stepped down. Doing so was his duty as a king and a father. What he felt, we have no way of knowing. If he shared private fears about passing on (understanding that the act of dying and making your way to Heaven was believed to be a violent process in the Middle Ages), they weren’t recorded. On March 20, 1413, on his way to make an offering before the tomb of Edward the Confessor in Westminster Abbey, Henry fell unconscious and was carried to the Jerusalem Chamber. When he regained his senses, he asked where he was and, when told, said that it had once been prophesied that he would die in Jerusalem. He had believed that meant the Holy Land, but he was in Jerusalem all the same. This last part, again, is almost too good to be true, but there is enough fact in the reported details to lend it some merit. But what is written down and what is actually said are, as we know, not always the same thing. It is entirely possible that Henry regretted what the consequences of the usurpation would be for him in death, though it’s worth noting that is not quite the same thing as regretting the action itself. It’s possible that the usurpation was discussed with Prince Henry, as it was alleged, given that we know the Prince was with his father during his last days. But the idea either acknowledged they had no right to the crown was more politically motivated than anything else, since that, of course, forgets the 1376 entail of Edward III discussed last week. In other words, some Lancastrians may have thought they only hurried up the succession, not altered its makeup altogether. In the end, Henry IV’s reign would end up mostly forgotten, lacking Richard II’s infamy or Henry V’s military glory. That in and of itself may be a strong case for him having been a fair ruler, for it’s the able administrators who usually get short shrift in the history books. Just ask Henry VII.